I just got home and noticed that this shirt is a tad…revealing. Glad everyone at work got to view the goods all day. Man. At least I'm getting to be a whiz at this job. I aim to be number one soon! "Yer in" a bad mood now, aren't you? You want to tell me to piss off, I know. Now that we've gotten that out of our system, I am flush with other stories. I did run two and a quarter miles last night, despite my precarious shoelace situation. Everyone has been telling me not to do long runs right before my half-marathon, so now I don't know what to do. The longest I've run is 8 miles. I mean, when training for this race. Need I remind you that girlfriend ran TWENTY-SIX POINT TWO miles back in 2000. So, the half-marathon is in four weeks. What should I do? Also, Marvin got a bunch of free tennis balls, which for some odd reason he has decided will be a necessary thing for his class this fall. Is he going to make each kid a tennis pro? Is he going to lob them at bad children? I asked him, but then I ignored his answer. He has put said balls in a box in the computer room. Okay. Hello? Who do you think is just a tad interested in a BOX OF TENNIS BALLS? She has been guarding these like a sentinel. She takes them out and puts them all over the house, then we put them away again, and what do you think happens seven seconds later? It'd be like setting a box of Barry Gibb in front of me. She can't leave it alone. This is as good as it gets for a dog. I have to go eat all the fruit I bought this weekend, before it goes bad. It will start robbing banks and voting Republican soon. I wish I could think of another pee joke to sign off. Crap. Tallulah looks like she’s won the dog lottery! I feel the need to visit the potty now. Thanks. As for your taper vs. long run before your half, how do you feel? You could still get a 10 miler in (soon) and then taper down to 8 or 6 the week before. But don’t think about the pee proofread during the race–could be troublesome. Serioulsy, did ya learn anything especially interesting while you were reading about pee? Oh I’m just pee green with envy.I wish I could run 8 miles. Ahahaha! “Yer in”, huh? That one took me a little while to get. I’m a little slow. Also loved the fruit going bad line. Ha! So, you have 4 weeks! I thought you had one week. Well. I would think you could taper for 2 weeks… Race day August 24th then? Then this weekend you could do 10. Then it’s sort of a toss up. You could go for the 12 the next weekend, you’ll have 2 weeks of recovery… Probably would be better to taper over 3 weeks (then do 8-9, then 5-6, then race), but it doesn’t seem that bad. I thought you were going to do 12 the weekend before the race. snort. I made 3 miles today. Now I can’t get up out of my chair. Her teeth remind me of Clutch Cargo. Who remembers that show? Maybe you could slice an X out of each tennis ball and put them on Talullah’s feet to keep them from scratching the hardwoods………? paybacks, man. If nothing else, it certainly distracts from the call of the shoelaces. Every picture of Tallulah is just darling, she is tres photogenic! The tennis ball game will keep all of you busy for hours! Tennis balls are used in many classrooms to shield the floors from being scratched by the desks. You slice into the ball and place one onto the bottom of each leg of the desk. Well, that is one use, anyway! I remember tennis balls were on the supplies list at my son’s elementary school a few years ago, I was extremely puzzled, then disappointed when I realized he wouldn’t be getting free tennis lessons! Wish I could hang out and write more comments, but when you gotta go, you gotta go. You’re a total “whiz”ard with words. 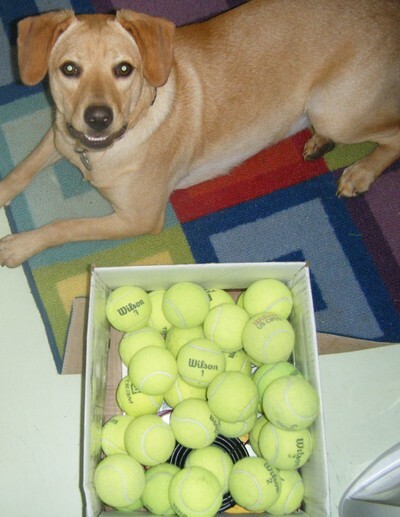 Yellow lab, yellow tennis balls…at least you are all color coordinated with your work. Poor dog… those balls are like doggy crack cocaine. She’s looking at those tennis balls the same way your coworkers were probably looking at “the twins” all day today. Bwwaahhh! 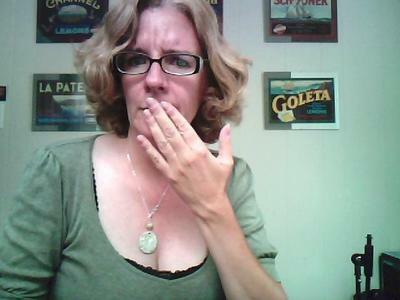 Laughing so loud my husband rushes in to see what’s wrong because he thinks I’m in pain or something. And I have to pee. Laughing hard when you have to pee? Not a good idea. Oh man June, you are funny. Is that the cutest dog picture ever. She does look like she is smiling…cute,cute,cute! Sorry about your pissy day. Hope tomorrow is better. Of course, it’s a total crap shoot. The ball has a magical power over dogs. Use it. You could at least lean forward a little so we could see what everyone else got to see. Ok, your dog so looks like she is smiling!